Here at Becky Adlington Training we pride ourselves on providing the best learning experience for our teachers, so we only employ the best tutors to deliver our courses. My vision of ensuring every child in Britain will be able to swim by the time they leave primary school is only achievable through having great swimming teachers. That is why I have set up my own training academy – to train up the best swimming teachers, who are passionate about inspiring young people to swim through consistently delivering fun and high-quality swimming lessons. Since setting up my own SwimStars programme and seeing it grow, it has made me realise just how important the quality of teachers is to make a difference to children in the water. 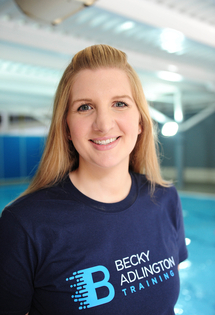 At Becky Adlington Training, we work hard to ensure our teachers are top class. We enhance their skills and experience through training to integrate the key values that I believe are important for great swimming lessons. I want every person coming onto a training course to have a great experience and leave feeling confident in how to teach, and make a real difference in getting more children swimming and having great swimming lessons. Kelly has been an Swim England tutor since 2007 and has worked in vocational training and workforce development ever since. Her career in swimming spans almost two decades, including 2 years as a lead teacher at the University of Wales, and a further 2 years as a Swimming Development Officer for Newport City Council. More recently, Kelly has worked at the Swim England in various positions covering the South West, Midlands and natonally in both traditional sports development and workforce development. To add to this, she has worked for an Ofsted Grade 1 National Training provider alongside multiple Swim England approved centres as a Commercial Manager, Tutor, Assessor and Internal Verifier. Chris has a career in the leisure industry spanning over 20 years, including tutoring for Swim Wales since 2015 and for Welsh Triathlon since 2014. Starting out as a swimming teacher and lifeguard for a local authority in 1998, Chris soon developed an interest for swimming and teaching. Since then, he has been a Royal Lifesaving Society Trainer Assessor since 2000. 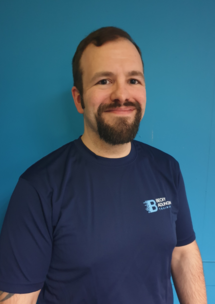 He has also spent time as a NVQ assessor delivering and assessing personal training and leisure management qualifications. His passion for swimming, teaching and coaching has led him to going back in to education himself and is currently studying Sports, Health and Performance Science at Glyndwr University. He is focussed on developing swimming teachers to give them the same opportunities he was given when he started his career. As a qualified RLSS trainer/assessor, Graeme has delivered national pool lifeguard courses and swim teacher rescue qualifications since 2013. Now a qualified Swim England tutor, he is eager to train the next generation of swim teachers through Becky Adlington Training. A passionate swim teacher and equally as passionate at tutoring, Graeme helps to share his wide range of experience at every opportunity. This experience includes operating a specialist pool for young people with complex disabilities, and more recently managing a team of teachers across Merseyside.